Massey's Tragic Legacy | Cover Story | Style Weekly - Richmond, VA local news, arts, and events. 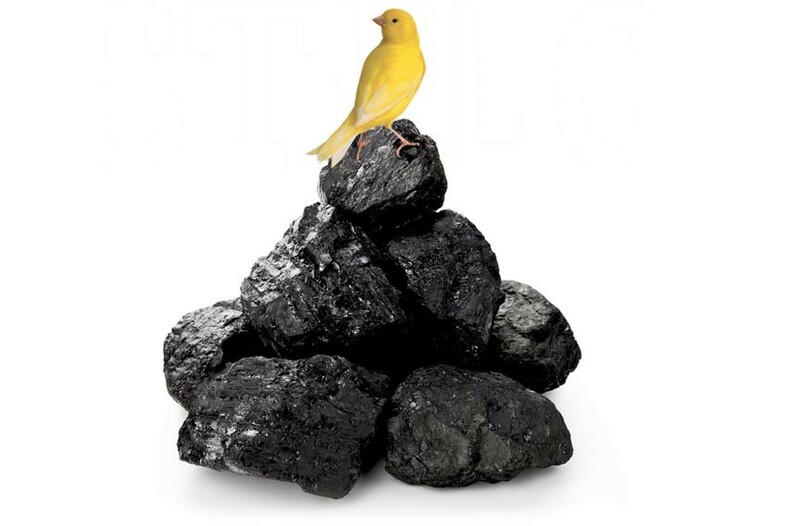 One of the country's most notorious symbols of Big Coal started right here in Richmond. Exploring the roots of Massey Energy with an exclusive excerpt from the new book "Thunder on the Mountain." "Thunder on the Mountain: Death at Massey and the Dirty Secrets Behind Big Coal" will be released Sept. 18 in both Hardcover and eBook form by St. Martin's Press. It's available at local bookstores and online at Amazon, Barnes & Noble, and IndieBound. For years, the name "Massey" has connoted philanthropy and good deeds in Richmond. 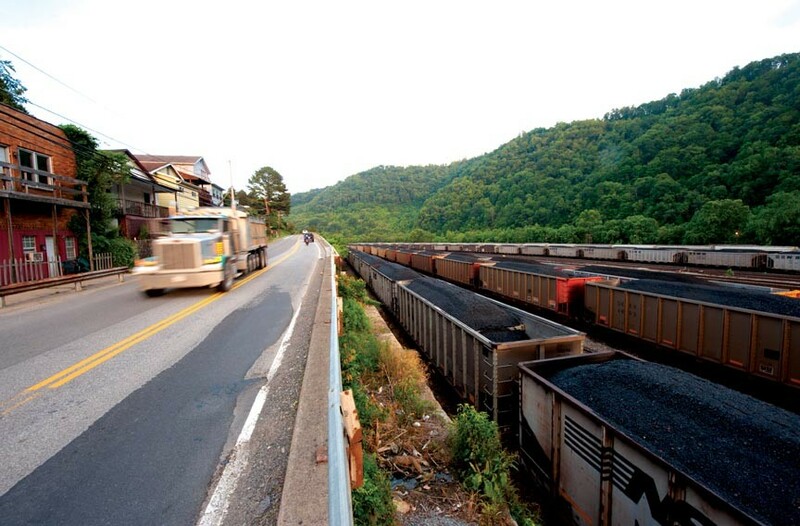 But Appalachian coal, the source of the family's wealth, has a sinister history. What evolved into Massey Energy — a firm run by the notorious corporate executive Donald Blankenship and legally unconnected with the local Massey family — became synonymous during the past decade with coal mine safety violations, divisive politics and environmental destruction through mountaintop removal strip-mining methods. Matters came to a head April 5, 2010, when an explosion killed 29 miners at Massey Energy's Upper Big Branch near Montcoal, W.Va., the country's deadliest mine disaster in 40 years. 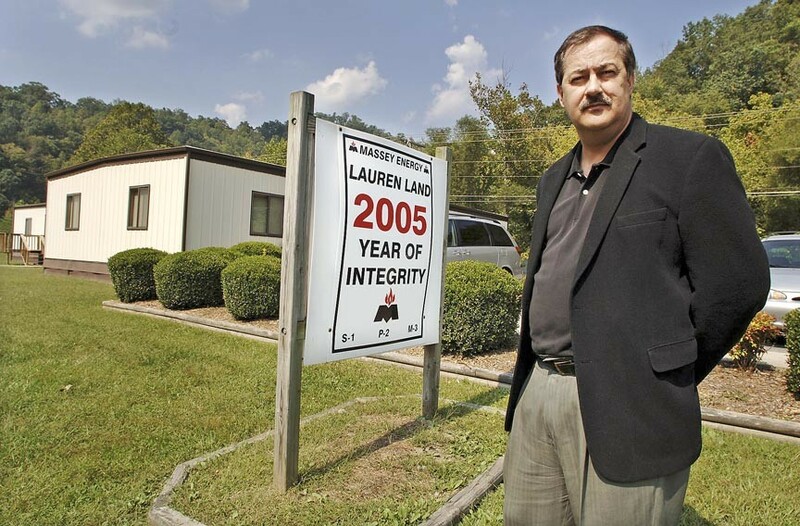 The ensuing furor ended Blankenship's career and forced the sale of the Richmond-based firm to Alpha Natural Resources of Bristol for $8 billion in June 2011. The following is an excerpt from Style Weekly Contributing Editor Peter A. Galuszka's new book, "Thunder on the Mountain, Death at Massey and the Dirty Secrets Behind Big Coal." Coal rail cars and trucks ship Massey coal at Williamson, W.Va.
E. Morgan Massey, the 85-year-old great-grandson of one of Massey Energy's founders, stretches back in his first-floor office in the Richmond firm's former dark, dour-looking headquarters building, a black, marble-clad structure that he helped design in 1950. Attired in a gray sports coat, slacks, and a checkered shirt, his pale blue eyes shining brightly, Massey has a Southern charm as he discusses his family's history. Behind his large desk is an abstract work in burnt reds and browns of a mountain landscape painted by a friend at Virginia Tech. On the side are maps of Venezuela and Colombia, where Evans Energy investment firm, which he now owns, has coal operations, plus China, where he has been doing coal business for two decades. His wife, Joan, ill with Parkinson's disease, sits at one side of the room. E. Morgan dotes on his wife, who has a tote bag lettered sailfish point, from Stuart, Fla., where they have a home. His other home is a town house on Richmond's Monument Avenue, a grand boulevard modeled vaguely after Paris's Champs-Élysées that is marked by dogwoods, magnolias, and statues of Confederate generals. He commutes there from Richmond in one of his two corporate jets, a Citation CJ2+ and a Citation CJ1, each worth about $4.5 million. He's still a pilot, having learned to fly during army training during World War II. "I'm a member of the UFOs," he says with a laugh, "the United Flying Octogenarians." The family may be a relative latecomer by Richmond's snooty standards, but even in the former capital of the Confederacy — where it can be decades before a newcomer is accepted socially — money talks. Coal money pumped out of the West Virginia hills by the Masseys over at least six decades begat the Massey Foundation in 1957, now worth more than $47 million. It supports college scholarships to worthy students in Virginia and West Virginia, jobs training programs, the arts and industrial safety and medical research. The largesse extends across downtown Richmond to the VCU Massey Cancer Center, part of Virginia Commonwealth University Health System and formerly the Medical College of Virginia. Its 500 researchers take promising results from labs to clinical trials and then into hospital use. Another beneficiary is the Virginia Institute of Marine Science, a Gloucester-based group that researches such aquatic ecosystems as the Chesapeake Bay and the Atlantic Ocean. One foundation contribution of $1 million in 2005 helped VIMS weather state budget cuts. But perhaps the favorite work of E. Morgan Massey, a vice president of the foundation, is his current plan with Virginia Tech to research ways to detect explosive levels of coal dust in mines and shut them down automatically. A.T. Massey Coal Company, Inc., the predecessor firm of Massey Energy, may have had generally good relations with its employees and was generous with philanthropy, but it had an iron fist when it came to unions. The hard lessons it learned battling for profit margin in the fickle coalfields made it a stickler for watching expenses. That said, A.T. Massey also had a reputation for letting its workers have their say — unlike what Massey Energy became under hard-charging Donald Blankenship. 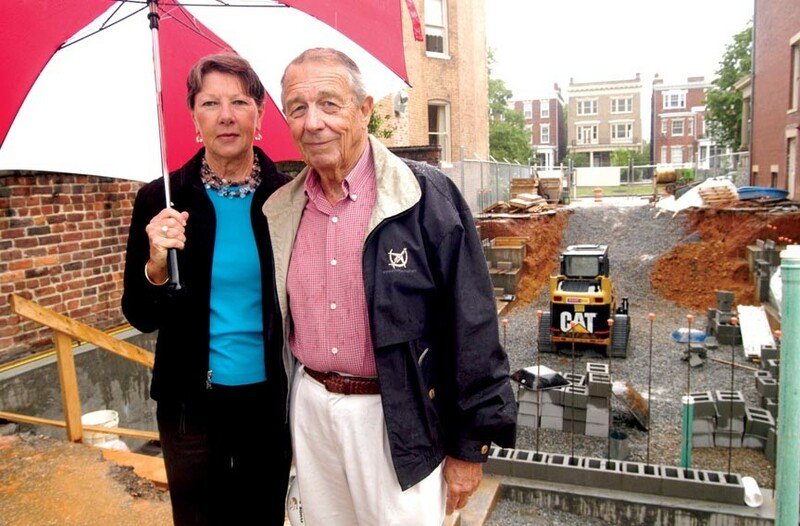 E. Morgan Massey and his wife, Joan, at their Monument Avenue home site in 2005. The origin of the Massey family in the coal business is not in Richmond but 250 miles to the west in Powellton, an unincorporated flyspeck of a town near Charleston, W.Va. Today, it is a collection of small houses along Armstrong Creek near Black Gunn Hollow with a grocery named Angela's as its only business. This tiny burg was where William Evans, a sheepherder and E. Morgan Massey's great-grandfather, emigrated from the town of Llanidloes in County of Powys, Wales, in 1876 to go into the coal-mining business in which he had some experience in the Welsh pits. With him was his Welsh partner Evan Powell, for whom Powellton was later named. At the time, the state of West Virginia was only 13 years old, its voters having seceded from Virginia in 1863, following disputes over slavery, landownership, and service in Confederate forces during the Civil War. Moving there was typical for a Welshman who faced much of the same scorn from those of English ancestry who had settled in the Tidewater area as the Celts who preceded them. A big change was pending, however, as the Chesapeake and Ohio Railway had just completed a line from the New River Gorge in West Virginia through the Allegheny Mountains to ports around James River and Chesapeake Bay, which gave them the opportunity to ship coal to Philadelphia and points north, including the metallurgical coal that went to steel mills. What started as Powell Coal changed names to Armstrong Coal. The company needed buildings. Helping was a skilled carpenter in the area named Antonio T. Massey, a tobacco farmer from Stuart, Va., who had moved to the Mountain State with his brothers Robert and James. Seeing an opportunity, they started their own coal business in the small town of Ansted, not far from Powellton. The new coal operators struggled in the primitive conditions. At the time, mining was a rudimentary affair with little thought given to air ventilation or other safety. Miners got their light from candles fixed on their helmets. Highly flammable methane gas tended to mass at the roofs of the mines since it was lighter than air. With the proper mix of oxygen, it would explode; otherwise, it would just burn. In order to work in the shafts, miners had to routinely burn off methane, and in an eerie foreshadowing of the Upper Big Branch disaster, a controlled methane burn went out of control and William Evans was injured so seriously that he died a few weeks later. The mineshaft floor where toxic carbon monoxide, also known as "blackdamp," collected, was no less dangerous. Caged canaries were brought in and set on the floor. If they suffocated, it was a warning that the carbon monoxide mix was potentially deadly. A.T. Massey spent his time on the surface after ending his mining career in 1897. He had special advantage. In 1894, he married Sarah Jane Evans, William Evans' daughter, who had eventually followed her father from Wales to West Virginia. When she first immigrated to the wilds of West Virginia from Wales, she wrote, "that I had moved to the ends of the earth." Their wedding took place at the Grand Hotel in Thurmond, W.Va., a fast growing railroad town in the New River Gorge that would soon become infamous for gambling and prostitution. The gorge at the New River, the second oldest river in the world, had practically overnight become a major center of the booming coal industry. Shaft mines were bored into the gorge towering a thousand feet up. Narrow gauge trains, mule teams, or crude, wooden conveyor systems carried the product to the riverside, the location of the main line of the Chesapeake and Ohio Railway that hauled away coal. Filling the gorge with thick, putrid-smelling smoke, scores of coke ovens — brick contraptions shaped like oversized beehives — worked night and day. Completing the vast ecological destruction, mining firms hacked down thousands of acres of virgin forest to make way for King Coal. Thurmond, situated almost in the middle of the gorge, was the focus of the fast money. At a hotel known as the Dun Glen, what was billed as the world's longest-running poker game was supposed to have taken place. The town's Balahack neighborhood became a notorious red-light district and perhaps a reason why another local hotel, the Lafayette, was known colloquially as the "Lay-flat." The Masseys were blessed with resources beyond the grasp of most coal town folk. Sarah had deeds to land and coal reserves given to her by her father. Still, when triplets followed the birth of her first son, Ivor, the country doctor was drunk, so they had to put him to bed and send for another doctor 50 miles away. A.T., who had been a deputy sheriff in Raleigh County, W.Va., took a job in Glen Jean, near Beckley, running a coal company store that provided goods to miners in exchange for script. In 1916, a new job took A.T. to Richmond, the largest city on the east side of the C&O main line that handled trainloads of coal from the Central Appalachian fields to Virginia seaports and markets farther away. Richmond was by then a bustling city with many attractions that Glen Jean lacked, such as fancy restaurants, museums, and several large, well-appointed department stores. For Ivor, the triplets, and Evan, it was to be a richer, fuller life. A.T. had a knack for selling coal. World War I had boosted demand for steel and coking coal as the United States ramped up production of rifles, helmets, and ships. He disposed of some mine interests while marketing coal from the Evans family mines under the new name of A.T. Massey Coal Company, Inc., in 1920. As his wealth grew, so did A.T.'s venal tendencies. "He drove as fast as he could and was very athletic and good looking. He had a lot of girlfriends and gave out 10-dollar bills to poor people. A real salesman type," states his grandson. "He was a rounder." 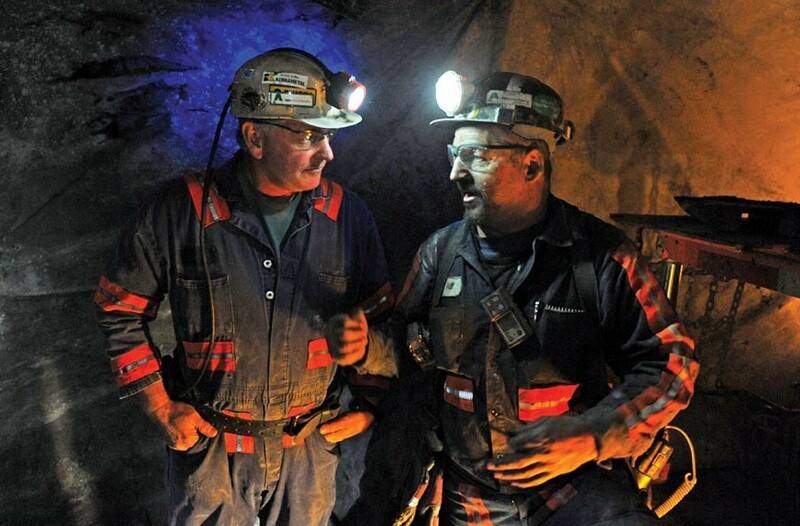 Miners at Alpha Natural Resources, which bought Massey Energy, work at Deep Mine 41 in Southwest Virginia. The firm by now had offices in Cincinnati, Chicago, and Cleveland to market its product. But A.T. was also using them as entertainment centers. His free-spending ways were threatening the family nest egg. In time, Evan, his son and E. Morgan's father, had moved up in company management. On July 27, 1934, he wrote his father a letter care of the posh, beaux arts Sinton Hotel in Cincinnati scolding him for racking up expenses for June 1934 in the amount of $1,480. Evan reminded his father that he had agreed to spend only $500 a month, but had been, in fact, spending $1,500 a month for the past several months. "Now no small company can have this heavy expense as your salary and expenses alone for you and your family are amounting to at least one fourth of the gross income of the company. This is absolutely ridiculous and has to be stopped." Evan ended his missive: "This letter is written with the best intentions and the best wishes for you and your future." A.T. however, continued to drain the firm and his family's wealth. As he spent money, his family lived modestly in a Victorian-style house on a sprawling green yard at 1203 Wilmington Ave., in Richmond's quaint Ginter Park neighborhood. In 1945, when A.T. died, the firm was $250,000 in the hole, loaded with liabilities and with no assets "other than the office furniture," says E. Morgan. "Nothing was being left to the seven children." The heirs bounced back just in time for World War II. Coal sales skyrocketed. The firm branched from sales into production. With Evan and William E. at the helm after A.T.'s death in 1945, the firm started buying up other coal firms. And E. Morgan, then an army veteran and recent college graduate with plenty of hands-on experience in family coal mines, was pushing for bigger and more acquisitions. Most of the coal mines in Europe had been destroyed, "so A. T. Massey started shipping coal to France and Germany in 10,000-ton Liberty ships. It created a boom in the coal business in 1946-47," E. Morgan says. Soon, exports expanded to Japan. Over the next six decades, foreign exports would become a profitable asset, helping A.T. Massey overcome lost demand as transportation shifted from coal to petroleum. Longer term, the move would prove even more prescient. By the 1960s, Germany and Japan had become economic powerhouses. Later still, in the 1980s and 1990s, China, India, and Brazil would grow beyond expectations. By 2009, despite a devastating recession in the United States, China and India would continue their expansion that called for lots more cars, buildings, bridges, and highways. All would need coal and lots of it, and Massey had what they needed. 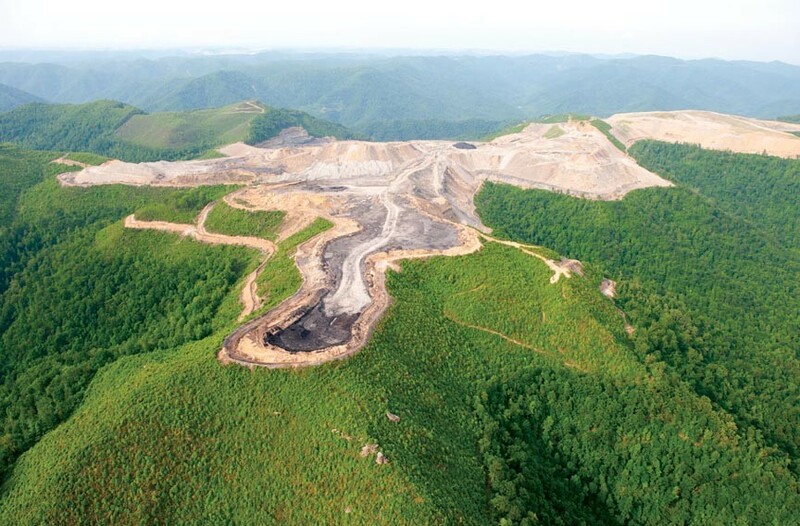 Massey's mountaintop removal surface mining rips apart thousands of acres of hills. E. Morgan Massey, the last family member to head the firm, matured under the protective wings of his father, Evan, who recognized that the youngster had a knack for things mechanical. E. Morgan said, "He let me overhaul a company Buick when I was only 14. It worked fine, but after a while the rings I had worked on started knocking. I didn't know about the torqueing that you were supposed to do with the rings. He sold the car real quick." At 17, E. Morgan started working as a "field man" in the coalfields and made key contacts that would help him later when he was in charge and growing the firm. After studying engineering at the University of Virginia for two years, he was called up for service in the Army Air Corps and trained as a pilot, but with the war ending, he was released before he saw action. It was back to the coalfields until he returned to Charlottesville to finish his engineering degree. His father, Evan, was running the company along with his uncle, but E. Morgan kept pushing to get heavily into production by recommending that they buy up key mines. Young E. Morgan was also spending a lot of time in the mines, which was unusual for a company heir apparent. He labored as a miner at Royalty Smokeless Coal with 10 men loading 400 tons a day in 10-hour shifts. Tapping his engineering skills, he tinkered with new forms of mining machines and schemes for conveyor belts to haul coal to the surface. Working in such a way had a personal price for E. Morgan. When his first wife became pregnant, Massey says, she didn't want to risk being in an area isolated from medical care, so he had to commute to and from Richmond. Massey Energy chief executive Don Blankenship outside his field headquarters in Belfry, Ky.
A. T. Massey Coal also ventured into surface or strip-mining, a practice that was becoming widespread in the 1950s Appalachians as surplus earth moving equipment left over after the war powered by diesel engines became available. Until a 1977 federal law, the practice left hills from Pennsylvania to Alabama with ugly brown gashes on their sides with uncontrolled runoff from coal waste polluting streams. The impacts of this form of strip-mining, however, cannot compare with the effects of today's mountaintop-removal practices, which can involves hundreds, if not thousands, of acres at a single mine. Hands-on experience also affected E. Morgan as he developed his managerial style. Lessons learned included keeping a sharp eye on production costs and avoiding unions wherever possible. In later years, he summed up his personal mission statement the following way: Customers came first, followed by shareholders. Employees rank third on his list of concerns, followed by the community and the environment. "Nothing happens without money from sales from customers," he says. Shareholders are in second place because they can be intrusive interlopers unfamiliar with the real problems of the business. Employees are there to work, but can't unless the money is flowing and the needs of shareholders are covered. So, by Massey's credo, community and the environment barely make the cut. The hard-charging young manager soon got into scrapes with unions. After buying unionized mines, the firm would suspend production until the labor contracts ran out. Then the mine would be reopened as a non-union mine. The modus operandi became known as the "Massey Doctrine," and Blankenship later kept up the practice. Morgan turned to subterfuge to hide his planning from union bosses. In one case, a new coal property was named Elm Development Company, with the letters in "Elm" being the first letters of the last names of Massey managers. "We didn't name it Elm Coal," he says. "That way the UMWA (United Mine Workers of America) missed it and we could get by with being non-union." The firm also had gotten into the practice of going down-market in buying coal-mining equipment, a move that some of the firm's managers opposed. "We always bought secondhand equipment and rebuilt it ourselves, and we used contract mining," Morgan says. This hand-me-down mentality became part of the company's culture and would come back to haunt Massey Energy when the use of faulty, aging equipment triggered the deadly disaster at Upper Big Branch. As its bank accounts grew, A. T. Massey Coal set up the Massey Foundation in 1957, which paved the way for the family's acceptance in high Richmond society. In the 1950s, the firm bought the first of its corporate aircraft that let executives avoid the torturous, time-consuming car trips up and down the dogleg roads of the West Virginia and Kentucky mountains. As the acquisitions piled up, Massey's revenues skyrocketed, eventually soaring from $100 million in the late 1970s to nearly $1 billion by the late 1990s. A West Virginia miner protests green activists demonstrating against mountaintop removal near Blair, W.Va., in June 2011. Although it couldn't have been known at the time, the practice of buying cheap gear inadvertently pushed A. T. Massey much further than its founders could ever have imagined. As was so often the case in the Appalachian coalfields, another tragic mine disaster had brought along another round of new regulations that required coal operators to change how they did business. And, as the Upper Big Branch fatalities showed years later, the regulations were never enough to prevent the horrors from happening again. At 5:30 on the morning of Nov. 20, 1968, an explosion shook a mine owned by Consolidation Coal a few miles west of Fairmont in northern West Virginia, sending flames 150 feet in the air and killing 78 miners. The following year, in 1969, Congress passed the Federal Coal Mine Health and Safety Act, which created the regulator Mine Safety and Health Administration, increased inspections, established penalties, and helped compensate miners afflicted with pneumoconiosis, or black lung disease. The flood of new rules meant that A. T. Massey could not continue its cheap ways of buying and upgrading secondhand equipment. Now the company needed lots of capital. The only way to get it was to go public and tap the stock markets. So, the Massey family maneuvered to become part of St. Joe Minerals Corporation, a global mining concern, and later Royal Dutch Shell and Flour, a big construction firm. E. Morgan, then 46, took over as president in 1972 just before two global oil price hikes would enhance coal markets. 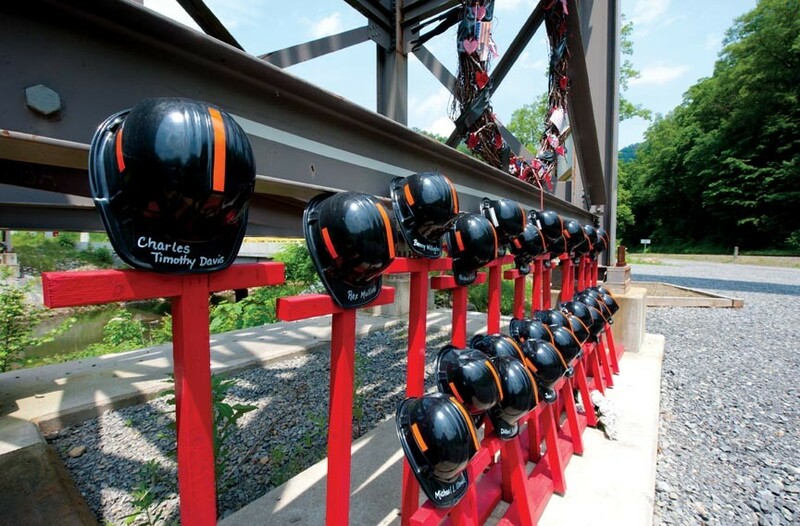 A memorial to 29 dead miners stands outside the Upper Big Branch Mine. For E. Morgan Massey, the 1980s were momentous years, especially for two events: One was the hiring of Don Blankenship. The other was E. Morgan's all-out war with the UMWA, in which he broke the back of six decades of union influence in the Central Appalachian coalfields. After two big booms in the 1970s, the coal market had settled into a prolonged recession by the 1980s. As did all operators, A. T. Massey scrambled to find ways to cut costs since coal prices were flat or depressed, such as bringing in more non-union contract miners and getting by with less expensive mining equipment. The UMWA was growing weaker because big corporations, many of them non-union, were busy developing rich coal basins in Wyoming and Montana. The flash point was the so-called Bituminous Coal Operators Association (BCOA) agreement, which acted as a kind of omnibus, industry-wide labor contract. Negotiated when the union had considerably more power, the agreement standardized benefits across individual coal companies. If one coal operator fudged, the UMWA would threaten to strike the entire industry in an enormous, preemptive attack. It kept coal barons in line for years. When Richard Trumka, now head of the AFL-CIO, became president of the UMWA in December 1983, he abandoned the all-encompassing strike aspects of the BCOA in favor of a strategy of "selective strikes" against errant coal firms. E. Morgan Massey seized the opening and notified the UMWA that it would no longer negotiate in a company-wide way, but the union would now have to hack out individual agreements with 14 supposedly independent Massey subsidiaries. It was a "divide and conquer" approach that had served A. T. Massey well for years. The union promptly struck Massey operations in Pennsylvania, West Virginia, and Kentucky. After a five-month-long standoff, the dispute erupted into conflict involving machine guns, bullets, hired paramilitary thugs, and guerrilla attacks. State police and private security men protected "scab" workers as they went to and from their mine jobs. Eleven bullets smashed into 35-year-old Don Blankenship's office, ruining his TV and forever hardening and radicalizing his view on unions. After the strike was settled, the Massey firm profited because air-pollution regulations had placed the coal found in the heart of his operational area in great demand. E. Morgan, however, was growing increasingly frustrated with his then corporate parent Fluor, which he thought did not give his firm enough credit for revenues. Blankenship, meanwhile, was rising quickly in the organization. He was named president of A. T. Massey in 1990 and was even considered later as a potential candidate as the head of Fluor. In 1992, with Massey's strong backing, Blankenship became chairman and chief executive officer A. T. Massey Coal Company, which was spun off as independent Massey Energy in 2000. By then, Massey had retired and liquidated his stock, though he kept an office for years on the first floor of the Massey headquarters building in Richmond until it was sold by Alpha Natural Resources, which bought Massey Energy in June 2011 after the tragedy and furor of the Upper Big Branch disaster. In addition to his global ventures, Massey still keeps a hand in Richmond. In 2005, he started plans to build a house on an extremely narrow lot on Monument Avenue, not far from the Lombardy Street abode where he was born in 1926. He's also busy with engineering plans at Virginia Tech to develop computerized monitors for use in China and elsewhere that detect explosive gases in mines and shut them down automatically. He was deeply troubled by Upper Big Branch, but he insists it was caused by a natural seismic event. He defended Blankenship right down to the wire, lobbying with key Massey Energy directors and personal allies and Richmond area residents Stanley Suboleski, James Crawford, and Baxter Philips. He even sent lead director Bobby Ray Inman, a former Navy admiral and head of the National Security Agency, a Christmas card in 2010 urging him to keep the company independent and not to force out Blankenship. Peter A. Galuszka is a contributing editor to Style Weekly. From "Thunder on the Mountain" by Peter A. Galuszka. Copyright © 2012 by the author and reprinted by permission of St. Martin's Press, LLC.